Pressure sores also known as bed sores, and referred to by medical professionals often as decubitus ulcers are extremely difficult to cure once created and very dangerous and even fatal for the patient if not treated as soon as possible. They can occur anywhere on a person's body but areas where bones are close to the skin and without much flesh are most often affected. A simplistic explanation of a pressure sore is an area of dead skin and flesh caused by the area affected being compressed between a bone in the patient's body and a hard surface. For example, when sitting on a hard wooden or concrete bench most people will begin shifting their weight very soon to relieve the discomfort in their buttocks in the area of their ischial tuberosities (the boney area in the center of each buttock when sitting) or coccyx (tailbone). This discomfort is a signal to the brain to move and if ignored will turn to a reddened painful area followed by the development of a pressure sore. People most at risk for developing pressure sores are those either have no sensation of pain in that area or those who cannot shift their weight off the sore area. Although pressure alone can be enough to create a pressure sore, there are usually contributing factors in addition to pressure. These include, but may not be limited to, heat, moisture, poor diet and and shearing. Heat can be simply the heat generated by the patient's own body when sitting or lying on a surface which doesn't allow the skin to breathe. Moisture can be from sweat or urination. Poor diet will affect the skin's health and skin which has lost elasticity or is generally unhealthy will speed the development of pressure sores. Shearing is when two surfaces try to slide against each other but can't. An exaggerated description of shearing might be sitting on a park slide that is sticky with a bare bottom, gravity wants you to slide down but your skin is holding it back. Special cushions are available to deal with pressure, moisture and heat as much as possible for wheelchair use and special overlays and mattresses are available for beds. Each manufacturer of these products has their own ideas as to which systems are best but it really is dependent on the patient's individual circumstances. The basic options for pressure relief products are foam, gel and air products or a combination of one or more of the three. 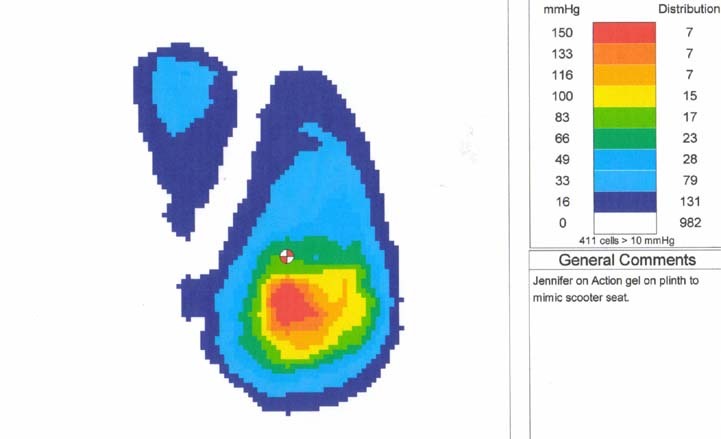 Pressure mapping is a technique for determining how much pressure is being applied to areas of the body by placing a sensor pad between the patient's body and the surface it is touching. By trying a pressure mapping system with several cushions or mattresses the dealer and therapist can get a visual chart showing the differences between the different cushions. Below are two images, of the right buttock, of a young lady named Jennifer. In normal cases you would image the entire buttock area but in Jen's case the right buttock was where the problem was. At the time Jen was about 13 years old and weighed about 75 lbs. She was uncomfortable on her scooter and we were trying to find a cushion which would solve her comfort issue. The first image is not actually on her scooter seat but on a padded surface similar to her scooter seat and the second is the cushion which worked best for her. 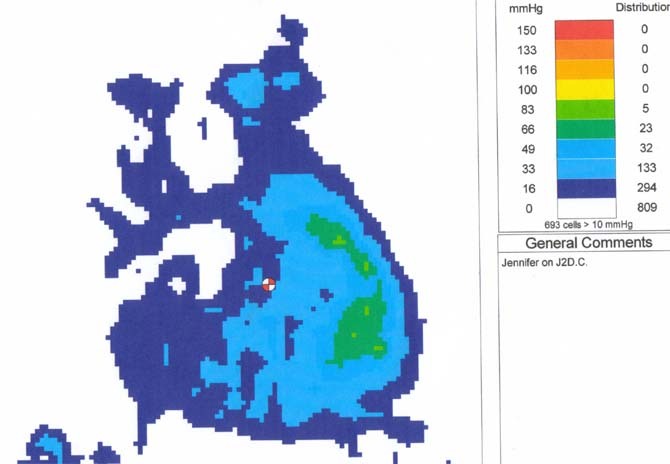 The scales on these images show the red areas as being the highest pressure areas and the dark blue being the lowest pressure areas. As you can see, the difference between the two is a dramatic example of how having a good cushion will disperse the user's weight over a larger area thus removing the small areas of high pressure. Although this was the right choice for Jen, someone heavier or with a different body size or shape might have to use a different product. In theory, the best results from a pressure relief cushion or mattress will be obtained if the skin is bare and directly on the product. People with pressure sores should be kept off them as much as possible and people who are at risk for pressure sores should be wearing clothing with the lightest possible and stretchiest materials. Unfortunately, walking through nursing homes and some hospitals you see these at risk people with diapers, clothing of heavy material or pads of some sort on the cushions to keep the pressure relief products clean. These practices increase heat and moisture which contribute to pressure sores and negating the pressure relief qualities of the cushion or mattress. Anyone who feels that cleaning a soiled cushion or patient's body is too much work won't believe how much more work it takes to treat someone with a pressure sore.